I hope you had a great Fourth of July! 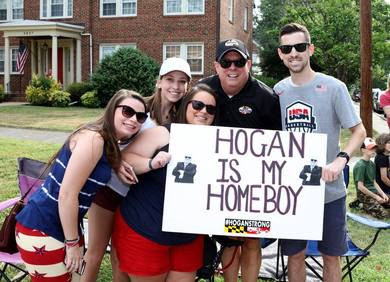 I was excited to join Marylanders in the Dundalk parade and the Towson parade later that day. The ability to meet so many different Marylanders in a single day is definitely one the best parts of my job. Check out more photos from the parades here. Throughout the month of June, we have continued to work tirelessly to protect our environment, encourage economic development and job creation, and partner with local governments to Change Maryland for the Better. To further our commitment to protecting and preserving the environment, I hosted the annual meeting of the Chesapeake Executive Council, which includes five states and Washington, D.C. I was honored to be unanimously elected to serve as the council’s new chair, and I look forward to working with our regional partners to preserve our most valuable natural asset – the Chesapeake Bay. I also had the exciting opportunity to lead a delegation of eight Maryland businesses on an economic development and trade mission to Europe, where we attended the 52nd Paris Air Show. Our executive team met with top global aerospace companies to promote our state’s thriving aerospace industry and attract new investments and jobs for Maryland. After the Air Show, I stopped in London to address cyber industry leaders at the Houses of Parliament and promote Maryland as a premier location for international cybersecurity companies. 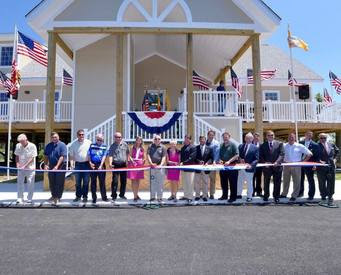 At the end of June, I delivered the keynote address at the 2017 Maryland Municipal League summer conference in Ocean City, where I announced two executive orders to create an Office of Rural Broadband and reform burdensome waste regulations. These actions reaffirm our focus on serving local communities in every corner of our state. Look out for more newsletters throughout the rest of the summer to keep up with how we’re working hard to Change Maryland for the Better! 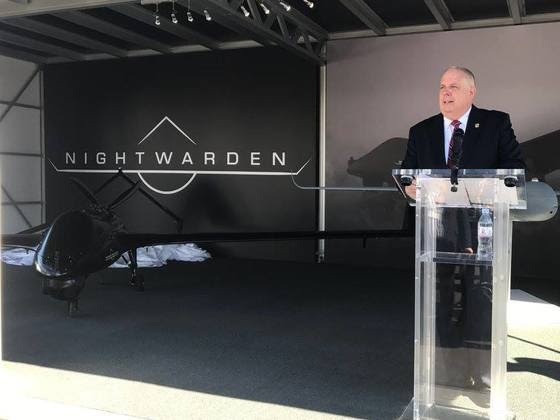 Governor Hogan unveils Textron Systems’ Nightwarden unmanned aircraft. Textron employs 1,400 Marylanders in Hunt Valley. Governor Larry Hogan led a delegation of eight Maryland businesses to the 52nd Paris Air Show, the world’s largest aerospace industry event. The State of Maryland highlighted a promotional booth at the weeklong show, which kicked off Monday, June 19 at Le Bourget Airport, where participating Maryland businesses showcased their products and services. The governor and executive team met with many of the world’s top aerospace companies to promote the state’s thriving aerospace industry and actively recruited investments and jobs for Maryland. Governor Hogan met with executives from Fives Group at the start of the Paris Air Show and announced that the company’s subsidiary, Fives Landis Corp., will open its new North American Technology Center at the company’s U.S. headquarters in Hagerstown. Fives Landis Corp., which recently marked its 120th anniversary in Maryland, is a leading manufacturer of precision grinding solutions and grinding accessories. The new 6,000 square-foot research and development and demonstration technology center will feature grinding systems from the company’s versatile product range. To support the new center and staff a new manufacturing line, Fives has hired 23 new employees at the Hagerstown facility and expects continued growth as market conditions allow. Governor Hogan also joined executives from global aerospace and defense solutions provider Telephonics Corp. to discuss the recent expansion of the company’s subsidiary Systems Engineering Group (SEG) in Columbia. A leading provider of combat, radar, and missile systems engineering and analysis, SEG has expanded its footprint in Columbia and hired 40 new employees over the past 18 months, with additional growth expected in the coming year. Governor Hogan signs an MOU alongside Maryland Commerce Secretary Mike Gill and Sir John Peace, chairman of the Midlands Engine initiative. 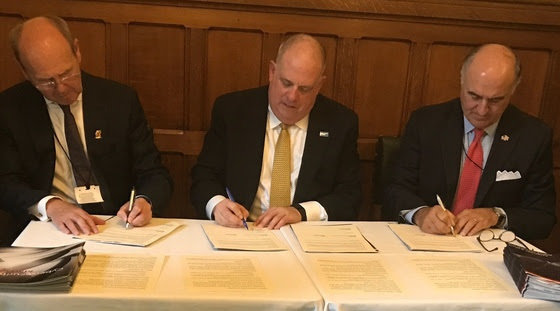 While in London, Governor Hogan addressed cyber industry leaders and joined the Maryland Department of Commerce and Midlands Engine for a ceremony during which a Memorandum of Understanding (MOU) was signed. The MOU will strengthen the relationship between Maryland, the center of research and innovation in cybersecurity in the United States, and the Midlands region, a premier cybersecurity cluster in the United Kingdom. As part of the agreement, an exchange program will be developed, by which U.K. cyber companies will visit Maryland to explore the U.S. market and to establish or increase a presence in the U.S., and Maryland cyber companies will visit the Midlands region for similar purposes. Governor Hogan also joined the Maryland Department of Commerce and bwtech@UMBC Research & Technology Park to announce the establishment of an international cybersecurity center, iCyberCenter@bwtech. The center will provide an executive training session, a 12-month incubator program, and other support to companies from the United Kingdom and other allied nations, to help them establish a foothold in the U.S. market. It is anticipated that 10 to 15 companies will participate in the program annually, with a minimum of 100 permanent jobs created in the next several years. 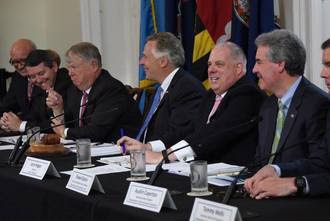 Governor Larry Hogan hosted the 2017 annual meeting of the Chesapeake Executive Council of the Chesapeake Bay Program, where he was elected to serve as the council’s new chair, succeeding Virginia Governor Terry McAuliffe. Governor Hogan also announced that the Maryland Department of Natural Resources awarded grant funding to 18 recipients through the Chesapeake and Atlantic Coastal Bays Trust Fund to improve the health of Maryland’s waterways. He also renewed Maryland’s commitment to environmental education by signing an executive order establishing Project Green Classrooms, an initiative to promote outdoor experiential activities and environmental education through Maryland’s schools, communities and public lands. 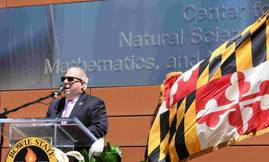 Governor Larry Hogan joined Bowie State University President Mickey L. Burnim, as well as science educators, state and local officials, and project partners to officially open the new state-of-the-art Center for Natural Sciences, Mathematics, and Nursing at a formal ribbon cutting ceremony. The State of Maryland provided $102 million in funding to construct the new facility, which will promote collaborative teaching and research and includes an expanded research laboratory that will integrate hands-on opportunities for undergraduate students. Vitreon America, Inc. announced plans to relocate its headquarters from Northern Virginia to Baltimore City in order to better partner with Maryland’s world-class medical and botanical research institutions. The company’s business model is based on a specialized plant database comprised of botanicals and phytochemicals that can be used in the creation of new medicines. The botanical research company anticipates creating 200 full-time jobs at their new Wicomico Street location over the next five years. In addition to relocating its headquarters, the company also plans to establish its laboratory, research center, and grow zones in Baltimore City in approximately 200,000 square-feet of space. 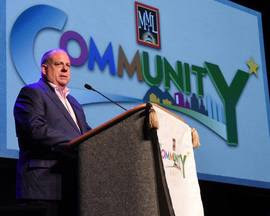 Governor Larry Hogan delivered the keynote address at the 2017 Maryland Municipal League (MML) summer conference in Ocean City, Md. In his remarks, the governor highlighted the administration’s efforts to spur economic development and job creation, improve infrastructure, and tackle the state’s evolving heroin and opioid crisis. In addition, the governor announced two new Executive Orders; one to create an Office of Rural Broadband and another to streamline and reform waste regulations. Read more about the executive orders here. County was named after – was the last surviving signer of the Declaration of Independence. He died in 1832 at age 95. 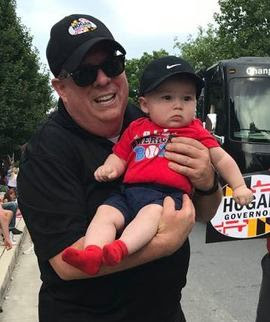 We had a great time celebrating Independence Day at the Dundalk and Towson parades with our fellow Marylanders – of all sizes!